This is a memo taken by a City of London Corporation representative after meeting David Davis, the minister for Brexit, on 15 November 2016. It was circulated within the City and leaked to the Financial Times. David Davis is bullish and not receptive to negative special pleading. He sees Brexit as a positive opportunity. But he is not close-minded. Well-constructed, factual solutions to problems can be made to him and he will be receptive. He is enjoying his role and appears to have a decent relationship with the Prime Minister. If anything he sees himself as a more flexible-minded problem solver than her. We can engage him but it needs to be in a way that he responds to positively. Impact on the City — Stated his desire for “facts and evidence” — would like to have clear, supported statistics and research about the impact on jobs and organisations as a result of not having access or adequate arrangements for different forms of trading or financial services activity. With such evidence he plans to gauge how negotiations can be pitched and what negatives or positive effects would result from trade-offs being made or certain models being adopted. Viewed the City, in part, as not yet having moved on from the Referendum and accepting the outcome. Relocation of banks — Commented that financial services PR firms are the most vocal groups warning of extreme negative consequences for financial services. Also queried whether the employees of US banks warning of relocating in Europe would actually relocate, given the unattractiveness of Frankfurt and other cities in the EU, in comparison with London. As a result, jobs will go back to New York not Europe. Possible Transitional arrangements — Stated that he was “not really interested” in the discussion around the arrangements, did not foresee any benefits and could be perceived as a delay to the process that is not something the Government can abide. However, expressed concern that there is an argument that the stability of the EU could be compromised by the UK’s “sudden” departure from the EU — the regulatory upheaval and potential for systemic risk could result in serious negative consequences for the whole of the EU. Davis emphasised the PM’s conference speech, in which it was stated that the UK Government wants a strong UK and a strong EU. He went on to say that if the EU, rather than UK stakeholders, want to have transitional arrangements he would be “more in favour. I will be kind”. Trump — Recognised the fear in the EU Member States that a “wave of nationalism” would sweep across Europe. Negotiations — Speculating on the positioning of certain countries, he thought that Spain would not, ultimately, pose a problem in the negotiations, neither would Germany but believed France would be the most hostile and difficult to compromise with. 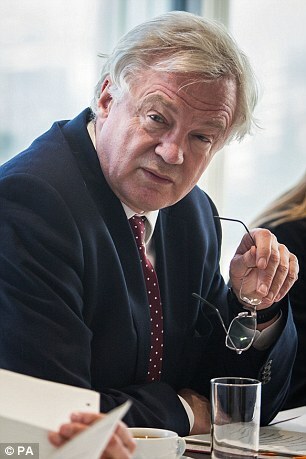 Querying what might happen if there is a desire for a punishing or hard negotiation and settlement for the UK, Davis said they would then need to switch to his “alternative strategy” that the UK Government will have to take a position of competing with other EU Member States for business — lower tax, softer regulation and other strong business incentives. Opined that the EU Member States, such as France had “no faith” in their economic models and ability to compete with an “Anglo-Saxon approach”. Immigration — Emphatic that UK will “take back control of its borders” but in the national interest. Speculated that a bespoke solution of permits and points style system would be used to determine entry to the UK. Very much understood that the UK would not benefit from a labour shortage. Emphasised that new apprenticeships, vocational and training programmes would be implemented “in step” with immigration changes, to ensure that domestic workers are best placed to fill UK vacancies and there is not an unnecessary skills shortage. Appreciated that the “up and coming” entrepreneur with little capital and poorly paid young scientific researcher would pose an issue in ensuring rising talent got through immigration control — did not currently have an answer but were looking at solutions. Access to the Single Market — In light of the position on immigration and the EU’s inflexible approach to the ‘four freedoms’, it is unlikely that the UK will achieve access. However, stated that if a trade deal such as CETA could be agreed, it would be unlikely to pose a significant problem as “most advantages” would be gained. A deal of this nature and the ‘Great Repeal Bill’ would actually mean that a lot of common standards would already be in place to trade. Equivalence — Addressing fears that the French would “pull out the rug”, Davis understood concerns but indicated a mechanism “to stop that happening quickly” could be found. More widely on regulation, speculated that the US is about to liberalise their regulation and this would make it much tougher to penalise the UK for not having appropriate regulation — as they would then also need to penalise trading partners such as the US. Passporting — Does not believe that business leaders actually understand when Passporting is actually required and is not as vital as many suggest. Exports — Did not see logic for pharmaceuticals to relocate. Believed it can be more beneficial to be outside and trading in to the EU. Trading models — Big spectrum of models, looking at somewhere in the middle of the models for Turkey, Switzerland and Norway. Clearing — Referencing the ECJ decision on clearing, commented that US reserves the right for it to step in if an issue in trading arises, UK may have to allow EU to do the same in euro-clearing. Article 50 — Liked the fact it acts as a deadline and requires a resolution to be found. Court case means it will likely now be triggered in very late March. Will use an expedited process and allow five days for the Bill to pass. Hinted that he would allow longer than necessary to proceed through Parliament, as “they would run out of speakers” to oppose the Bill and the Lords would start to “tie itself up” and not make a coherent argument. Will trigger Article 50 with an opening approach of open access on all services and goods without tariffs in the UK. The Government’s man in charge of Brexit is ‘not really interested’ in seeking a transitional deal with the EU to smooth our departure, a leaked memo revealed today. Brexit Secretary David Davis made the comments during a meeting with representatives of the City of London Corporation (CLC). He said he thought it ‘unlikely’ Britain would stay in the European single market after Brexit, as the EU would be ‘inflexible’ about the need to retain freedom of movement. The idea of a transitional deal is one of the issues that is dividing the Government over its Brexit strategy. Businesses have called for an interim deal to avoid the sudden hit to trade when Britain cuts ties with Brussels. Last month Theresa May signalled she supported the idea after she told business leaders they would not face a ‘cliff edge’ when we leave. But Brexit supporters warn that a transitional deal could effectively keep Britain in the EU for years as we would be forced to continue paying billions into the EU while a permanent arrangement is agreed. According to the leaked notes on Mr Davis’ meeting with representatives from the City, which were obtained by the Financial Times, the Brexit Secretary suggested Britain could secure a trade deal like the CETA agreement between the EU and Canada, which will remove most trade tariffs. The memo said he was looking for a future trading relationship ‘somewhere in the middle of the models for Turkey, Switzerland and Norway’. And he was quoted as saying that Britain’s opening approach to the EU would be to offer ‘open access on all services and goods without tariffs in the UK’. Plans to allow UK nationals to retain their EU citizenship after Brexit are to form part of the European Parliament’s negotiating position in upcoming talks. The ‘associate citizenship’ status would give those who adopt it the right of freedom of movement and residence throughout the EU as well as the right to vote for a representative in the European Parliament. It would be made available to nationals of former member states of the EU who ‘feel and wish to be part of the European project’. The proposal was put forward last month by Luxembourg MEP Charles Goerens for inclusion in a future EU treaty. 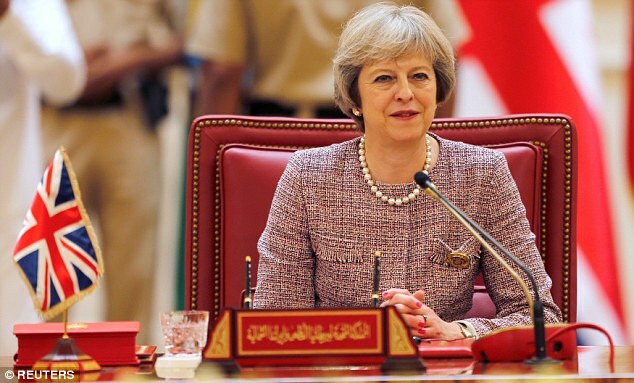 But following Wednesday’s House of Commons vote backing Theresa May’s plan to trigger withdrawal talks by the end of March, Mr Goerens agreed with the European Parliament’s chief Brexit negotiator Guy Verhofstadt that it should be brought forward more quickly. 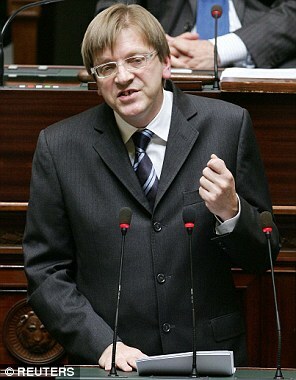 Mr Verhofstadt told a meeting of the Parliament’s Constitutional Affairs Committee in Brussels on Thursday that he would ensure associate citizenship status was ‘on the table’ for the withdrawal talks under Article 50 of the EU Treaties. ‘Some things cannot wait until treaty change,’ said Mr Verhofstadt. Mr Goerens said that Wednesday’s vote had made the prospect of Article 50 being invoked ‘very real indeed’. He had therefore agreed with Mr Verhofstadt that ‘this has become a very important issue that cannot await treaty change – as was my intention when I first tabled my amendment – since this might take years’. A spokesman for Mr Davis’s Department for Exiting the EU (DExEU) insisted that the document did not ‘properly reflect’ his views or Government policy. The Brexit Secretary was ‘looking at all options’ to deliver a smooth and orderly exit from the EU, said the spokesman. Business has been pushing for a transitional arrangement with the EU to prevent a sudden ‘cliff edge’ change in regulations and tariffs on the day when the UK leaves – probably in 2019. CBI director general Carolyn Fairbairn told MPs this week that her members wanted ‘an adjustment period’ to adapt to the new arrangements, and Mrs May told the organisation’s conference last month that she understood their concerns on the issue. But the memo taken by a CLC representative of the November 15 meeting with Mr Davis recorded that he was ‘not really interested’ in the discussion around the arrangements (and) did not foresee any benefits’. A transition deal ‘could be perceived as a delay to the process that is not something the Government can abide’, the note said. He would however be ready to consider any request from the EU for transitional arrangements, saying he would be ‘more in favour – I will be kind’. Mr Davis appeared to anticipate that the Supreme Court will reject the Government’s appeal – heard this week – against a ruling requiring them to seek parliamentary approval before starting withdrawal negotiations under Article 50 of the EU treaties. The memo states that he said the court case meant Article 50 was likely to be triggered in ‘very late March’, with the Government using an ‘expedited process’ to push a Bill through both Houses in the space of five days. Mr Davis was reported to have said that he did not expect Germany or Spain to pose a problem in the two-year negotiations over Britain’s future relationship with the EU, but said that France ‘would be the most hostile and difficult to compromise with’. He indicated that a mechanism was being sought to prevent Paris ‘pulling out the rug’ on talks, according to the memo. And he said that if the EU took a hard line on ‘punishing’ the UK, the Government was ready to adopt a position of competing with its former partners to attract businesses with lower taxes and softer regulation. The memo described the Brexit Secretary as ‘bullish and not receptive to negative special pleading’. It said he played down suggestions that Brexit would lead to an exodus of bankers to alternative trading centres on continental Europe, given ‘the unattractiveness of Frankfurt and other cities in the EU in comparison with London’. Instead, jobs were more likely to go to New York. The DExEU spokesman said the Government was ‘engaging widely’ with businesses about the ‘challenges and opportunities’ of Brexit. ‘These are two-way discussions about a whole range of issues and potential outcomes,’ said the spokesman. ‘This account does not properly reflect Government policy or [Mr Davis’s] view. The Prime Minister’s official spokeswoman declined to discuss the contents of the CLC memo, but said that it represented ‘one interpretation of the discussion’.